Most firms strip out unnecessary views before sharing models. While it only takes a few minutes, I’m surprised that people still do this manually. There are several shortcuts that can make things easier, especially when you are undertaking this task regularly. Using schedules to your advantage is an easy solution. If you use view parameters you can easily create a view deletion schedule (view list). Either use a default view parameter such as ‘Discipline’ or use your own shared parameters and enter the name of your choice in the parameter field. Make sure the parameter is set correctly when you create any views and then just filter (does not equal) your schedule to display the views you want to delete. For example, you may filter out Co-ordination (or whatever naming you use in the parameter field) to ensure that these views are retained for your consultants. I usually try and agree on the views that are required by the other disciplines at the outset. Then when it comes time to clean up your model before issuing it, just select all of the views in your schedule and delete them. The other option is to use an Add-In. One such solution is from Case. It’s suitably titled ‘Delete Sheets, Views, and Revit Links‘. You don’t have the control that you have with the schedule method, you just select whether you want to delete sheets, views and/or links and they will all be removed with a click. 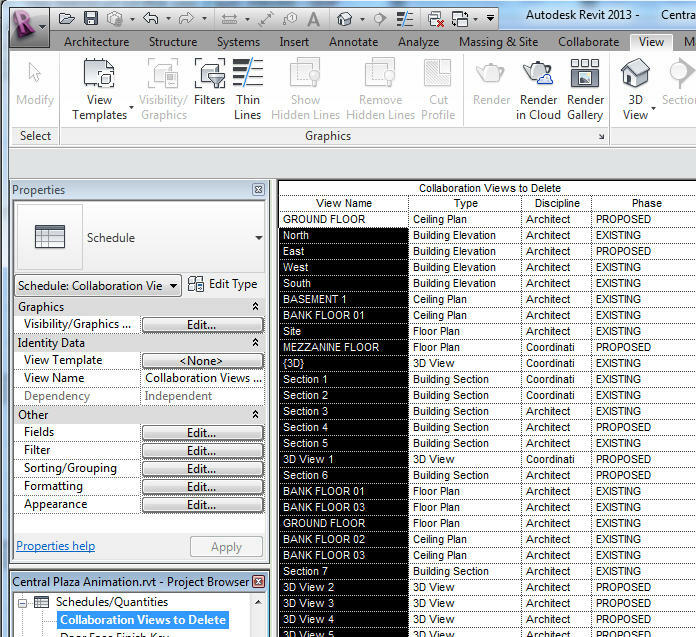 Saving time, even if only a few minutes, leads to a betterRevit! That looks like a greate tool! I’ve been doing this with pre-made schedules, but this could save even more time. …unfortunatly, the link on the Case page points to the ‘Add In Manager’ app, and not the ‘Delete Sheets’ app. Yes they have a few really useful Add-Ins. The Case Add-In Manager is what you need to use to install any/all of the Case apps. If you log in to the Case website and navigate to the Add-In Manager page, then copy and paste the link at the bottom of the page into Internet Explorer (only browser you can use) to start the download and installation process.